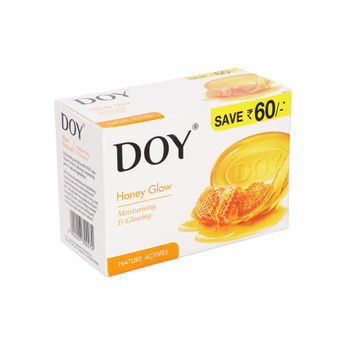 Take the first step to nourished skin with the Doy Honey Glow Soap. Honey's rich nutrients like protein, amino acids, and vitamins & its occlusive properties lock the moisture in the skin and help nourish the skin. Doy Honey Glow Soap is enriched with pure honey that helps nourish your skin to get younger-looking, more radiant skin and brings out the pure natural you. Additional Information: Manufactured and marketed by VVF which is an Indian multinational organization, well established in the Personal Care industry, Doy mission is to help you discover and connect with your natural selves, thereby unlocking your real beauty. Doy knows that what goes on your body is as important as what goes in your body, and that's why they have created a range of products that offer the experience and benefits of pure, natural ingredients which help nurture and nourish your natural beauty. Explore the entire range of Combos @ Nykaa available on Nykaa. Shop more Doy products here.You can browse through the complete world of Doy Combos @ Nykaa .